After seeing Bagan in Myanmar, I got the Indiana Jones bug. Ancient temples were my new playgrounds. 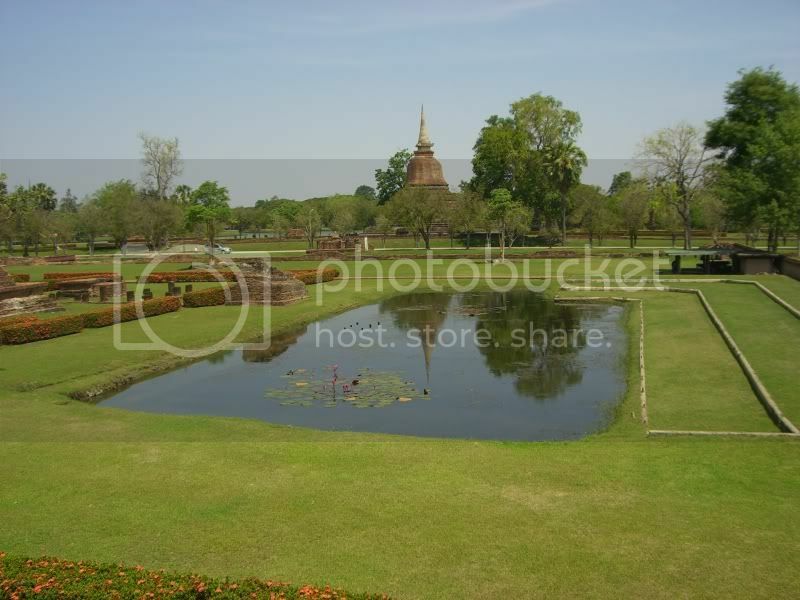 Sukhothai was the next target on my hit list. It's the cradle of Thai civilization, where the alphabet was invented. --a lot of it was destroyed by Burmese armies in the past. 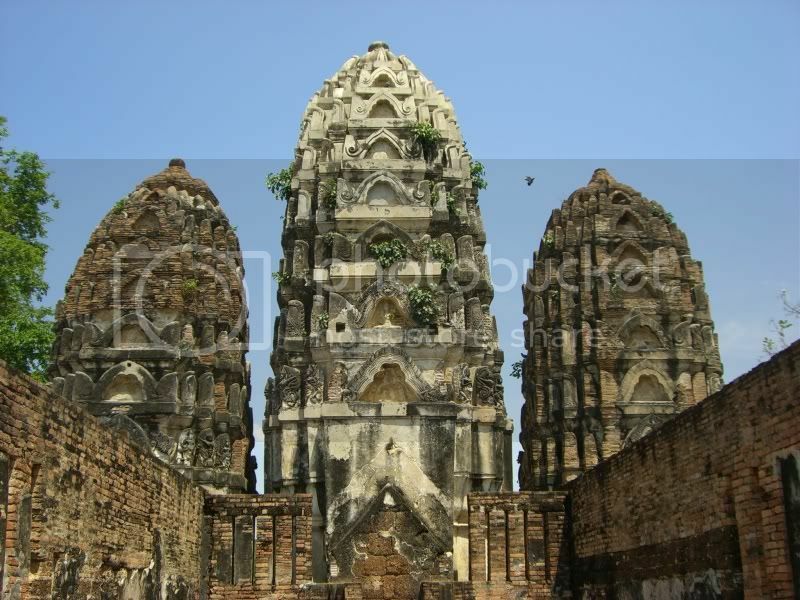 Sukhothai is better preserved. 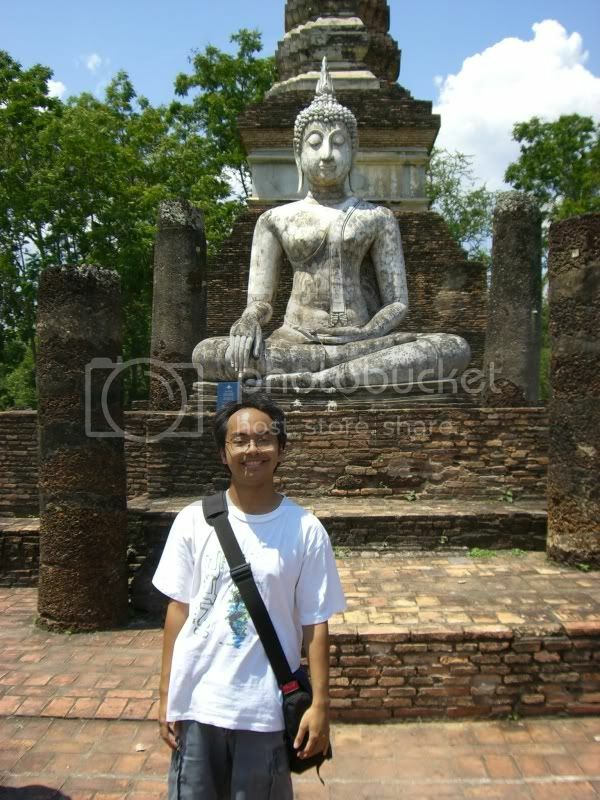 --Ayutthaya's traditional and modern architecture are all mixed together. 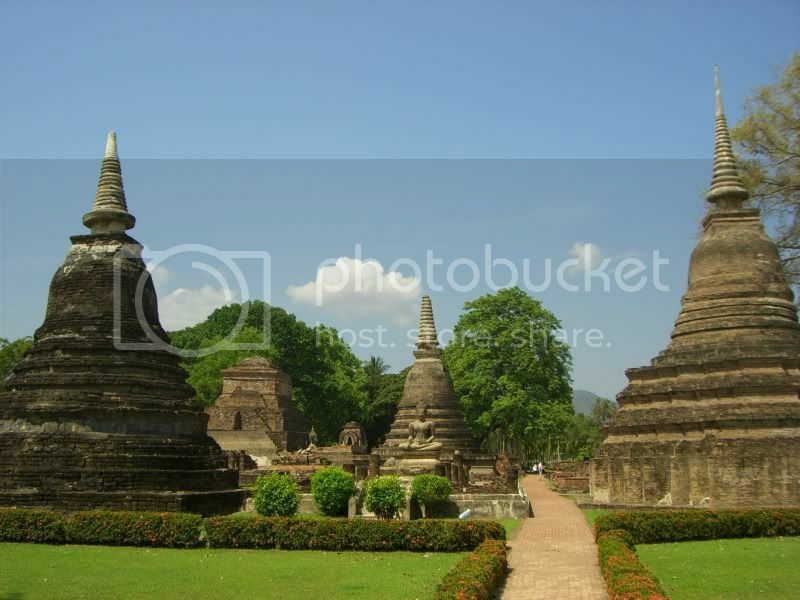 Old and New Sukhothai are kept separate. What grabbed my attention were the little accoutrements of civilization that marked Thailand as more advanced than Myanmar: footlights strategically placed around each temple, glossy new displays with English-language descriptions, and tasteful landscaping. It was pretty cool to see sidewalks and rows of bushes leading to each temple. While walking around, I had the feeling of being in an outdoor museum. 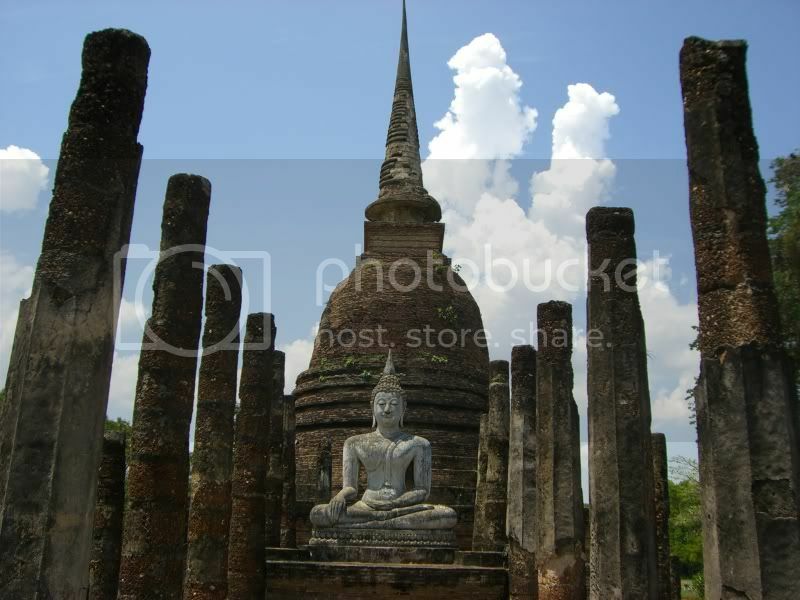 Sukhothai was a good example of proper temple maintenance. The lush greenery was a pleasant surprise. In Bagan, the various kings had cleared the forest, lending the place the barren atmosphere of a desert on Mars. 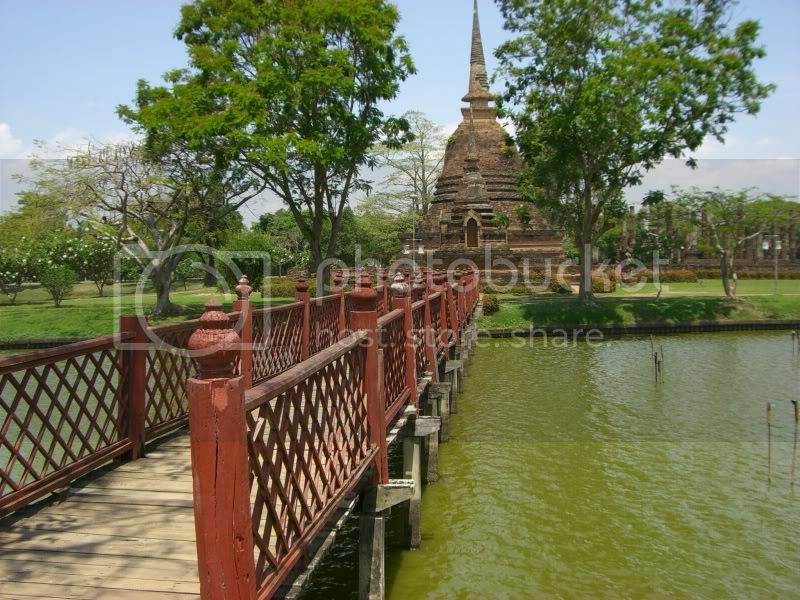 Sukhothai felt more in harmony with its natural environment. Like I did in Bagan, I rented a driver for the day. Ended up with a motorized tuk tuk instead of a horse cart. Again with Thailand being more modern than Myanmar! Backpackers usually prefer to see temples the cheap way: taking a public bus or songthaew to the main entrance, then renting a bike at the site. I saw this in Bagan too. I prefer to save my energy for climbing around the temples and taking photos, instead of getting from place to place. Riding around in a tuk tuk also served as a natural fan, with the wind in my face cooling me down. 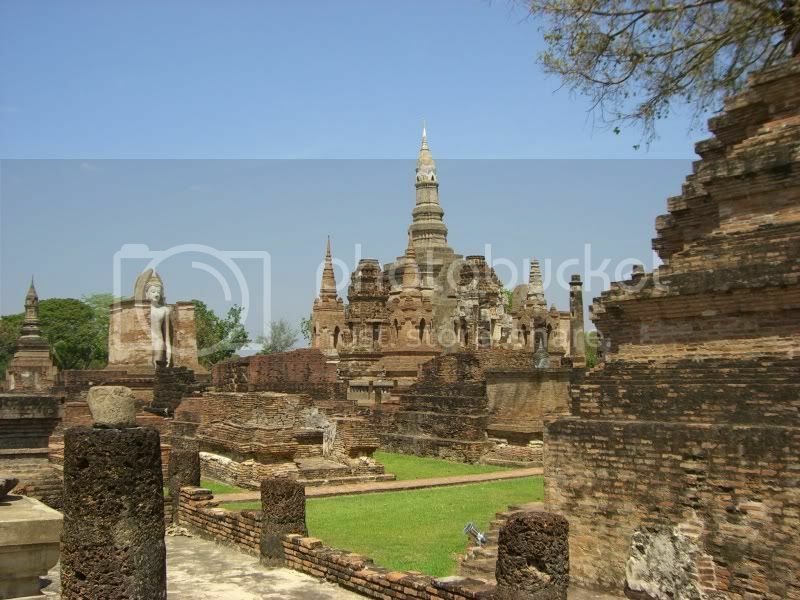 The Wat Mahathat temple complex was the first site I hit. The soaring stupas and scattered ruins made me think this was the Thai equivalent of the Roman Forum in Italy. Later, at Wat Sri Sawai, I saw Hindu temples built in the Khmer style. They were a good preview of what I'd see at Angkor Wat in Cambodia. 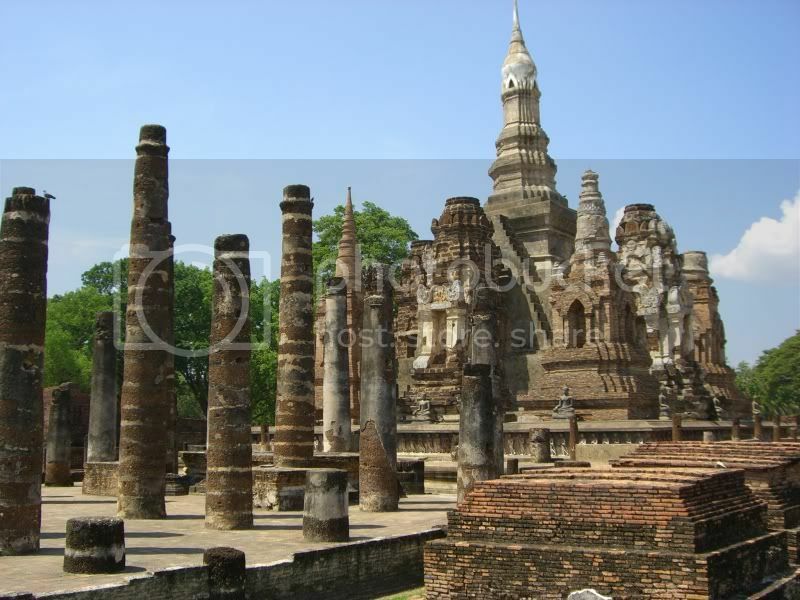 After a while, I recognized a standard layout for Sukhothai temples: two lines of columns leading up to a seated Buddha with a lotus-bud stupa behind it. 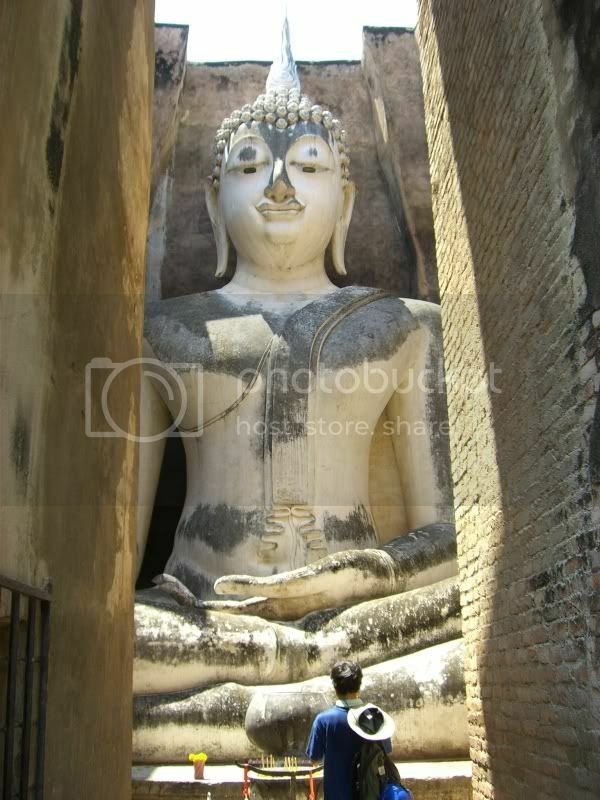 Comparisons with Bagan are unavoidable, and one of the first things I observed was that Sukhothai's Buddhas were a lot smaller. Burmese also love to coat their Buddhas in gold leaf, while Thais leave their Buddhas with a more natural stone appearance. The one Buddha that could take on any in Bagan was at Wat Sri Chum. That specimen was a monster. Although I usually prefer not to have tourists in the same photograph as monuments, this was an exception. Having this mere mortal in the photo really gives you a sense of the scale of this Buddha. Thailand is the tourism capital of Southeast Asia, so I was surprised at how few tourists there were. While I was on the train, I got the impression that most people head straight to Chiang Mai and skip Sukhothai. For me, it was a nice spot to break up the trip between Bangkok and Chiang Mai. Bus: Depart from Mo Chit Bus station in the north of Bangkok. You can take the Skytrain to Mo Chit Skytrain station, then take a 10-minute taxi ride the rest of the way. Buses leave frequently and take 6-7 hours. Train: The closest train station is in Phitsanulok. Getting to Sukhothai this way is a transport marathon. The train from Bangkok to Phitsanulok takes 5-6 hours. Then you have to take a bicycle rickshaw from the Phitsanulok train station to Phitsanulok bus station. 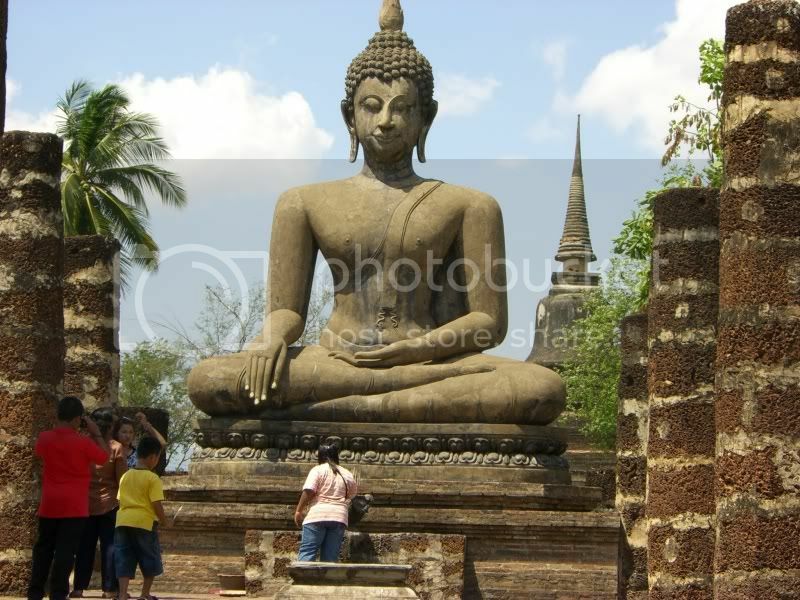 Take a bus for 1 hour to Sukhothai bus station. Then take a songthaew to your guesthouse. I stayed at Garden House in a bungalow with private bathroom. There was this weird smell in my room, so I wouldn't stay there again. The Ban Thai Guesthouse next door seemed better. Dream Cafe -- a gourmet restaurant that serves Thai and Western dishes. A classy choice in otherwise drab New Sukhothai.